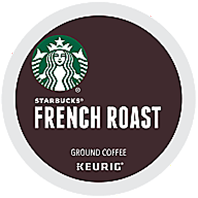 French Roast is Starbucks darkest and boldest offering. A blend of high quality beans from Central America, Africa, and Asia are used to produce this intense, full-bodied coffee. This delectably smoky cup is perfect for anyone who likes their coffee on the dark side!